Auto (RC) GB1 Brave: [Place this Unit into the Soul] When your Vanguard is attacked, you can pay the cost. If you pay it, choose 1 of your Vanguards, during that battle it gains Power+10000. Auto: [Choose 1 card from your hand, discard it] When this Unit is placed on (GC), you can pay the cost. If you pay it, choose 1 of your Units being attacked, during that battle, it cannot be hit. Auto GB2 Brave: When this Unit is placed on (GC), and you have an “Altmile” Vanguard, Soul Charge 1 Card. And if you have 1 or less cards in your hand, choose 1 of your Units being attacked, it cannot be Hit during that battle. 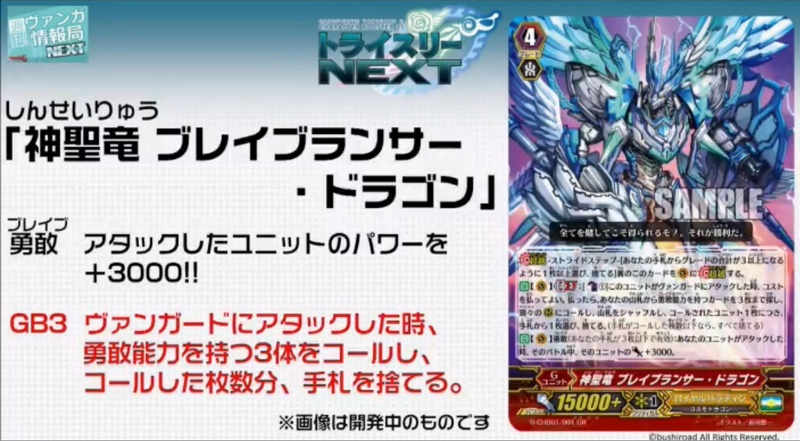 Auto (VC) GB3: [Counter Blast 1 Card] When this Unit attacks a Vanguard, you can pay the cost. If you pay it, search your Deck for up to 3 cards with the Brave ability, Call them to separate (RC), shuffle that Deck, and for each Unit called, choose 1 card from your hand, discard it. Auto (VC) Brave: When your Unit attacks, during that battle, that Unit gains Power+3000.